It is said that baseball is a game of inches. Baseball is a game of degrees. While today's best pitchers simply do not have the degrees of flexibility of baseball's greats, the ones with the biggest Stride Angles are at the top of the heap. 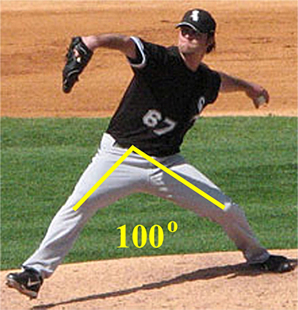 The Stride Angle is the maximum opening between the front and trailing leg of a pitcher as he strides toward the plate. 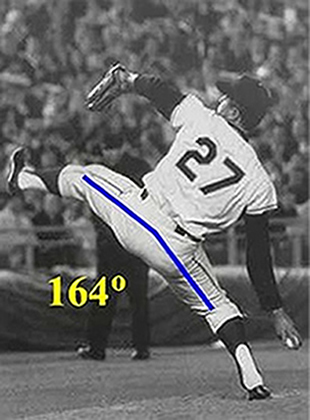 Historically great pitchers all had Stride Angles of 120° or more. The Stride Angle is critical to pitching because it allows the pitcher to accelerate toward the plate, plant his forward foot and abruptly stop his forward motion, which then whips his upper body toward the plate. You see this same type of upper body acceleration when you slam on the brakes on your car, and your passengers are thrown forward. But the Stride Angle is important for another reason. It indicates the overall flexibility of the hips. The Stride Angle is small when the hips are stiff. 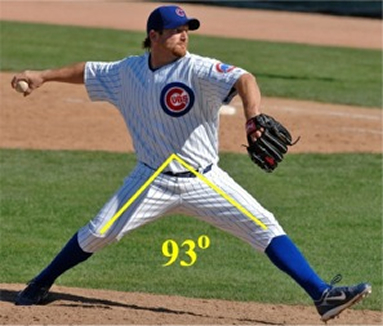 The other major contribution of force to the pitch is the rotation of the hips. If the hips are stiff, most of the muscle energy used to rotate them will be used to overcome their stiffness. As a result, hip rotation will be slow, and the pitcher will have to make up for the lack of force from his lower body with his arm. When you overuse the arm like this, it gets tired and you lose control. Ultimately, the arm develops tears and scar tissue, and the pitcher has to leave the mound for good. This is why pitchers with big Stride Angles not only have better records; they also have long careers. Their lower body is doing most of the work of pitching. Pitchers with small Stride Angles may have a Cy Young year—but then they quickly decline—as can be seen in the case of Barry Zito, whose Stride Angle is only 78°. So, here are the present top ten pitchers in baseball compared to some of the all-time greats. Edinson Volquez is the best pitcher this season, with an ERA of 1.71, and the biggest Stride Angle of the current top ten. 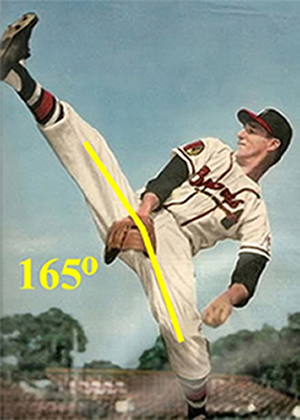 Warren Spahn, with his Stride Angle of 165°, had a WHIP of 1.195, pitching a 23-7 year at age 42, and winning a total of 363 games, the most of any pitcher in the modern live ball era. 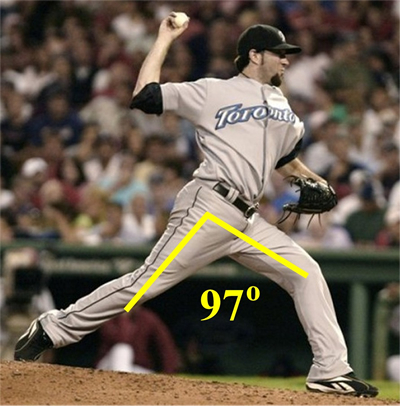 Cliff Lee has a Stride Angle of only 95°. Despite a small Stride Angle, Lee has an ERA of 2.45, the third best in baseball. He did suffer an abdominal strain this year, which is common in pitchers with small Stride Angles, as they are forced to overuse their abdominals to make up for the lack of power from their legs and hips. 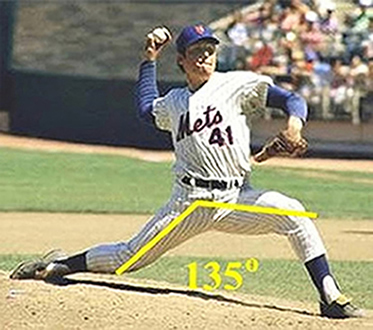 Hall-of-Famer Tom Seaver pitched for 20 years to age 42, thanks to a Stride Angle of 135°. Seaver won three Cy Young awards and once struck out ten opposing players in a row. Tim Lincecum has a Stride Angle of 115° (second to Volquez) with an ERA of 2.54. Unlike the two guys ahead of him, he does not have a speed or injury problem. At 5'11" and only 160 lbs., he does not have the weight (190 lbs.) of Cliff Lee or the height (6'3") of Duchscherer, but can make the most of his small frame because of a flexible lower body. 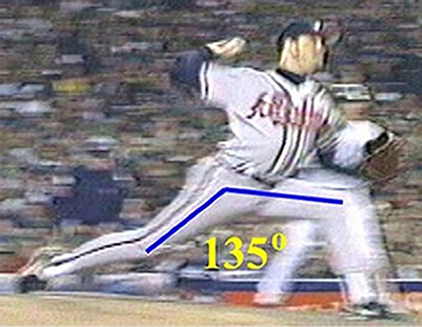 Greg Maddux, who is the best current career pitcher, has a Stride Angle of 135°. He won more games in the 1990's than any other pitcher, winning the Cy Young in four consecutive years with a combined ERA of only 1.98. His WHIP for his 23-year career so far is 1.141. 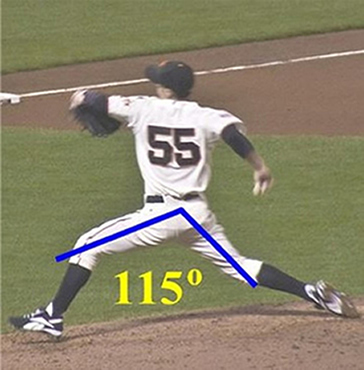 It would be interesting to see what Lincecum could do with a 135° Stride Angle. Ben Sheets has a Stride Angle of 115°, and an ERA of 2.59, which makes him #5 in the MLB list of today's top pitchers. 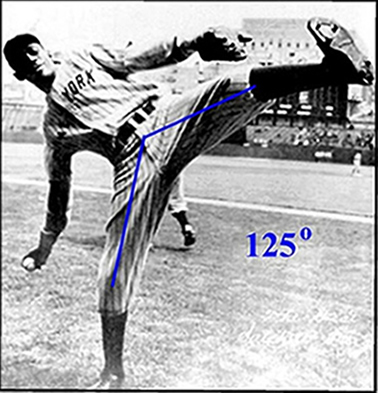 Satchel Paige, another pitching great, had a Stride Angle of 125°. When pictured next to Sandy Koufax, you can see that Ryan Dempster is really restricted in his hips and legs. He is #6, with an ERA of 2.63, but he can only pitch as a closer because his stiff hips and legs do not contribute much power to his pitch. He has to rely solely on his arm, which tires quickly. 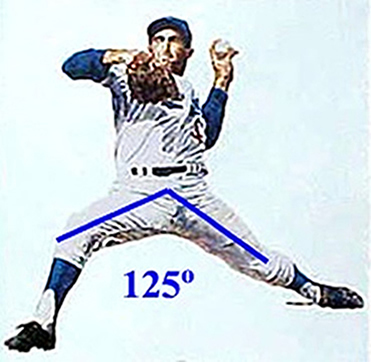 Sandy Koufax had a Stride Angle of 125°. His 12-year career had a cumulative WHIP of just 1.106. His Win-Loss stats for his last four years are legendary: 25-5, 19-5, 26-8 and 27-9, all with a WHIP under .986. Shaun Marcum, with a Stride Angle of only 97°, has an ERA of 2.65, which places him #7 in the nation. Pitchers with such a small Stride Angle find that their arm wears out after a few years in the majors from the stress of pitching. Right now he is on the disabled list with an elbow injury that is common in pitchers with a small Stride Angle. Marcum is an an example of lots of talent upstairs, but no support downstairs. 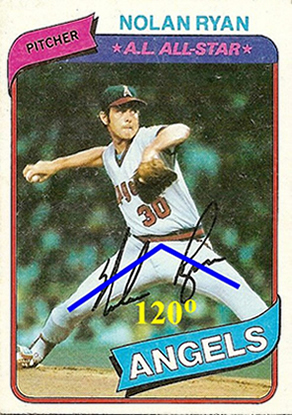 By contrast, Nolan Ryan had a Stride Angle of 120° and the greatest number of career strikeouts at 5,714. John Danks is 23 years old and is ranked #8, with an ERA 2.80. But his Stride Angle is only 74% of pitcher Greg Maddux, who is almost twice his age. While Danks can be proud of his prowess, we don't see a Maddux-like career with such a small Stride Angle. Felix Hernandez is pitching well this year. He is #9 on the list, with an ERA of 2.93. 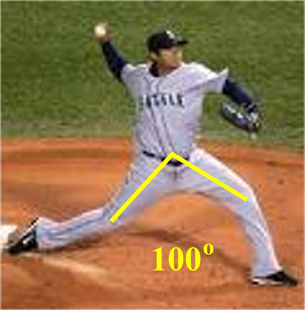 But his Stride Angle of only 100° is problematical. He is 6'3", 225 lbs., so he has some mass at his disposal. 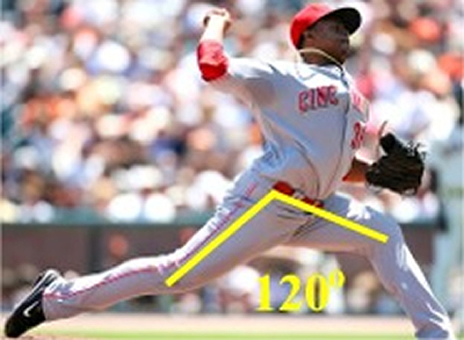 But his lower body is not contributing much to his pitch with a Stride Angle of only 100°. We expect his performance to decline as his arm gets tired. Johan Santana is also pitching well this year. He is #10 nation-wide with an ERA of 2.93. Although he has won two Cy Young's, his Stride Angle of only 95° spells trouble. We expect him to develop injuries in the next few years and return to being a reliever. This is obviously a very talented group of pitchers—the ten best in the nation. 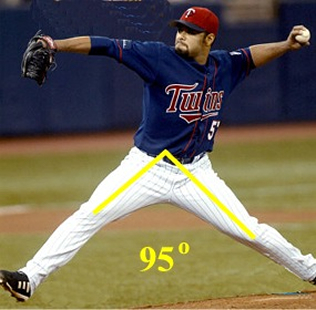 With the exception of Volquez, they simply do not have the lower body flexibility of historically great pitchers. With bigger Stride Angles, they would all pitch even better than they do now. But more importantly, they would pitch with less strain on their arm. It should be clear by now that the bigger the Stride Angle, the better the performance and the longer the career. Some may think that pitcher's have a 'natural' Stride Angle, one that is inherent, which to their minds means 'unchangeable'. But we do not find that to be the case. We increase Stride Angles all the time. But does increasing the Stride Angle actually improve performance? The answer is that it does. Here are some before and after photos of Stanford pitcher David Verduzco. As we increased Dave's Stride Angle from 104° to 112°, his fastball went from 88 to 92 mph. Because his more flexible legs and hips contributed more power to his pitch, Dave was able to use his arm muscles more for control. As a result, his percentage of strikes thrown rose from 50% to 64%. He also reported that he tired less and was able to pitch longer into the game. How do we increase Stride Angle? 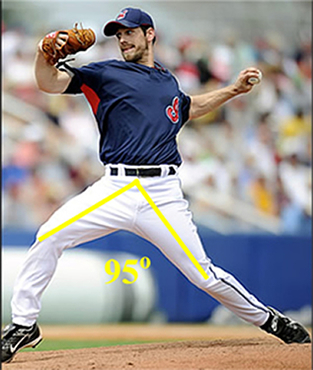 Pitchers have small Stride Angles because microfibers (a mild form of scar tissue) have developed in the connective tissue between the muscles of the legs and hips, binding them together. Because they are scar tissue, microfibers cannot be released by stretching. Pitchers who have microfibers in the connective tissue surrounding the muscles of their legs and hips think that they are 'naturally' stiff, while pitchers who have not developed many microfibers think they are 'naturally' loose. The pitchers with few microfibers find that stretching helps improve their flexibility. Pitchers with microfibers find that it does not. But when you have even a mild injury (falls on court), overuse (lifting weights, running) or stress , microfibers form as part of the healing process to immobilize the area. Microfibers are nature's internal cast. We release these microfibers with Microfiber Reduction, our proprietary form of connective tissue massage. As you can see here, Microfiber Reduction improves flexibility far beyond what stretching alone can do. 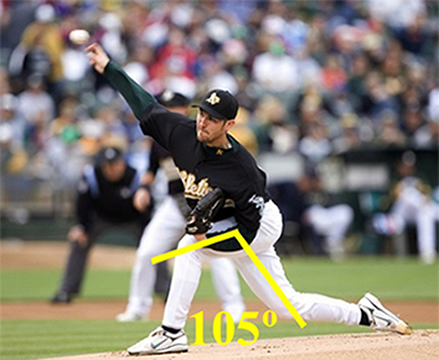 Baseball pitchers, even if they are in the top ten in the country, should measure their Stride Angle. If it is less than 135°, they are not getting enough power from their lower body to maintain a long career. Pitching puts a lot of stress on the arm and shoulder. Having a small Stride Angle increases that stress exponentially, not only in accelerating the arm, but also while decelerating. Most rotator cuff tears are in the back of the shoulder cuff. 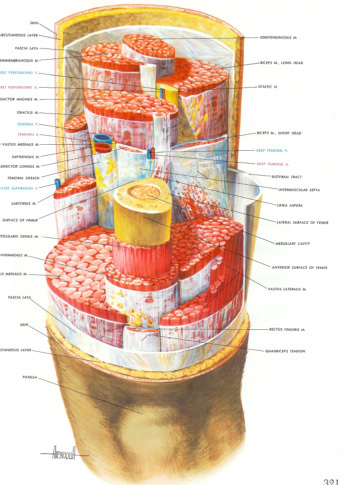 These small muscles have to slow down at arm after going 90 mph. If the hips are flexible, the deceleration can be spread out over the large muscles of the back and hips. If the hips are stiff, the trunk and hips stop too soon, and the rear rotator cuff has to bear the burden of applying the brakes. 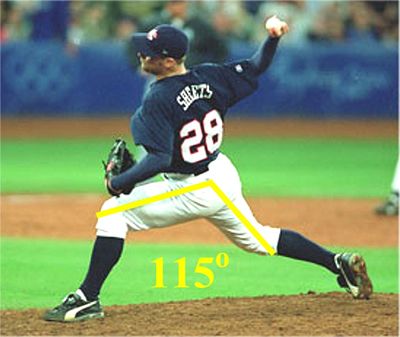 Increasing a pitcher's Stride Angle to 135° is the best way to insure a long, rewarding career and a place in the Hall of Fame.